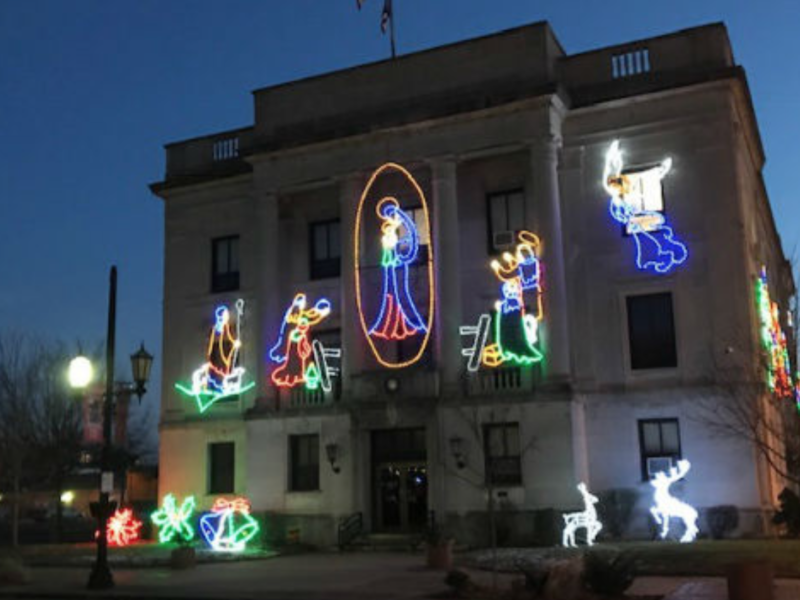 Liberty Counsel has offered to defend a Christmas light display containing a Nativity scene after the Freedom From Religion Foundation (FFRF) demanded its removal from the exterior walls of the Hocking County Courthouse in Logan, Ohio. The Christmas light collection displayed in downtown Logan and on the courthouse exterior is a 79-year-old holiday tradition which consists of secular and religious Christmas symbols. The collection includes a Nativity scene displayed on the exterior of the courthouse. On the same side of the courthouse are a number of secular Christmas holiday symbols, including a poinsettia, holly leaf wreath, and Christmas bells, as well as a lighted Christmas tree and two lighted reindeer on the lawn. The FFRF letter alludes to the fact that a Christmas display consisting of sacred and secular elements is constitutional, but fails to mention its own case, Freedom from Religion Foundation, Inc. v. City of Warren, explicitly supporting that fact. In that case, the Sixth Circuit Court of Appeals ruled that a holiday display which included both secular and religious symbols in Warren, Michigan’s civic center was a constitutional form of “government speech.” The court upheld Warren’s rejection of FFRF’s demand to display a sign stating, “religion is but myth and superstition” next to the Nativity scene. The Hocking County Courthouse contains part of the citywide Christmas light collection and display. A Logan resident, the late James D. Wells, created the lighted Christmas holiday decorations, beginning in 1939. The hand-drawn designs were sketched out in chalk on cement floor, and steel bar stock was carefully bent to match. The steel pieces were welded or bolted together, painted, and lights and garland were added. Wells’ nine children assisted their father in painting the colored lights by hand. Wells designed more pieces to add to the existing light collection each year and now residents consider it a cherished seasonal display of public art. Many of the original elements have been restored in recent years and are displayed throughout the city. Liberty Counsel’s Founder and Chairman Mat Staver said, “Publicly sponsored Nativity scenes on public property are constitutional, especially when the display includes other secular symbols of the holiday. Despite its threats, the FFRF ‘grinches’ cannot steal Christmas from the residents of Logan by removing a long-time cherished Nativity scene. Celebrating or acknowledging Christmas is legal on public property, and references to God or Jesus should not be censored. We stand by the city and will offer legal counsel to any city facing threats from the FFRF or other individuals,” said Staver. Liberty Counsel has launched its sixteenth annual Friend or Foe Christmas Campaign and provides a memorandum to offer guidance regarding the public celebration of religious holidays. The campaign is designed to educate, and, if necessary, to litigate to make sure that religious viewpoints are not censored from Christmas and holiday themes. Liberty Counsel has been actively monitoring cases across the country where there is intimidation by officials and groups to remove the celebration of Christmas in public and private sectors. Liberty Counsel has successfully educated and reversed these anti-Christmas actions in all of these situations.